The problem confronting CREATE was the opposite of most other projects in this book: the need not to resort to clichés when designing the A & P supermarket in Basking Ridge which includes and adjacent pharmacy. 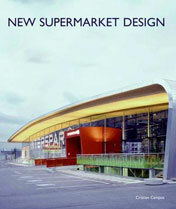 The center's architecture had to make reference to the area's history and convey a sense that the entire supermarket had been planned as a town square. To achieve this, the center was designed to reflect the architecture of A & P supermarkets from the early 1900's. The problems became clear when trying to reconcile this "retro" architecture with modern antifire legislation by way of a steel superstructure that would imitate the wooden structures of more than 100 years ago. Another obstacle came from the fact that both the supermarket and the annexed pharmacy are double the size of their twentieth century predecessors. The Basking Ridge supermarket is a true journey into the past, an homage to supermarkets from the turn of the twentieth century, and not, as could be thought at first glance, just an attempt at a retro style.